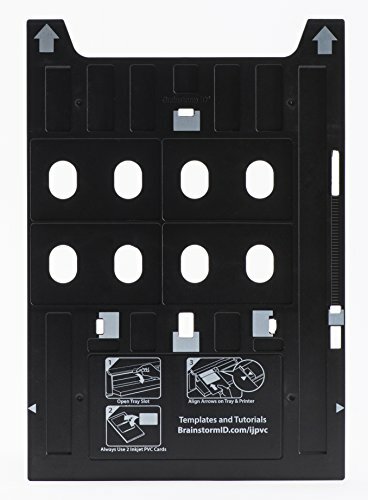 This tray replaces the Epson tray normally used for CD/DVD disc printing. Works with the following Epson Printers: Artisan 1430, Stylus Photo 1400, 1410, 1430W, 1500W, R800, R1800, R1900, R2000, R2880, and SureColor P400 & P600. Will not work with any other printers. Always place 4 cards in the tray when printing. PRINT YOUR OWN PVC ID CARDS: This Brainstorm ID Epson tray replacement works with the Epson Artisan 1430, Stylus Photo 1400, 1410, 1430W, 1500W, R800, R1800, R1900, R2000, R2880, and SureColor P400 & P600 printers. It works in place of the normal CD/DVD tray that comes with your printer. PRINTS 4 CARDS AT ONCE: Holds and Prints four Inkjet PVC Cards to allow printing 4 cards at a time. Always place 4 cards in the tray when printing, even when only printing one card.